3Q18 PATMI of S$1.41bn missed our estimate by 8%; Revenue is in line with our expectations, underpinned by strong trading income. Expenses came in higher than expected. 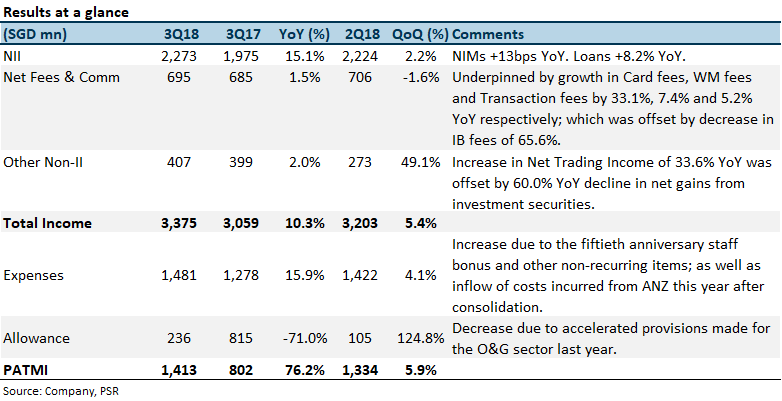 NIM expanded 13 bps YoY to 1.86% (3Q17: 1.73%) and 1 bps QoQ (2Q18: 1.85%). Loans maintained high single-digit growth at 8.2% YoY, driven by non-trade corporate loans and consumer loans. Allowances declined 71% YoY due to accelerated O&G provisions last year. NPL ratio remained stable at 1.6% (3Q17: 1.7%). Maintain BUY at a lower target price of S$29.00 (previously S$33.32). We rolled over our valuation to 2019e and modelled in a more volatile and lower growth environment. We also trimmed our FY18/19 earnings by 3-5%. + NIM at two-year highs. 3Q18’s NIM touched 1.86%, expanding 13bps YoY. The highest in nine quarters. NIM expansion was in line with higher interest rates in Singapore and Hong Kong, which saw loan yield rising faster than deposit costs. Loan yields improved 47bps YoY, interbank yields +41bps YoY and securities yield +32bps YoY; while the cost of funds rose 37bps YoY. Management’s guidance of 1.86-1.87% for 4Q18 NIM seems well within reach with the expectations of further rate hikes and a 60-65% pass-through rate. +Loan growth maintained its steady pace at 8.2% YoY. Non-trade corporate loans and consumer loans drove loan growth. There was a slowdown in trade loans growth due to unattractive pricing. DBS market share of Singapore housing loan remains strong at 31%. Management guided loan growth for 2019 to be a mid-single digit. Despite the economy still being rather robust, but because of macroeconomic uncertainties, a more moderated growth is in line. + Hong Kong’s 9M earnings surged 43% YoY. Hong Kong’s NII grew 27% YoY, driven by rising interest rates which gave a 24 bps increase in NIM to 1.97%. The rise in HIBOR in Hong Kong has become much more significant with a growing CASA base and loans growth was robust at 16% YoY. Hong Kong contributed 20% to total revenue. + Normalization of credit costs to 21 bps as compared to 195 bps a year ago. The plunge in allowances of 71.0% YoY was due to substantial accelerated provisions made for the O&G sector last year. Moving forward into 2019, asset quality is expected to remain stable, but the SME portfolio might see a deterioration in loan quality as interest rates rise. However, the SME portfolio is small in comparison to the entire loan portfolio, and the potential delinquencies and provisions made would not be material. – CIR rose to 43.9% from 3Q17’s 41.8% due to one-off items such as the 50th-anniversary staff bonus, rebranding campaign costs and litigation costs. Excluding these non-recurring items, 3Q18’s CIR stands at 43%, in line with 1H18. Operating expenses increased 15.9% YoY in 3Q18, faster than operating income’s growth of 10.3%; due to more costs than income brought on by ANZ which accounted for 6% of the increase in expenses. More costs could be expected in 2019 as DBS expands into Delhi and Bombay. NIM will continue to improve with rising rates. The management expects 2 -4 rate hikes moving forward with an average of 60-65% pass-through rate. Around half of DBS’s loan book is pegged to SIBOR and the other half pegged to fixed rates. While it generally takes a few months for the SIBOR to reprice, it takes a couple of years for a fixed rate to do so. Hence a large portion of the rise in interest rates has yet to flow into Singapore’s books with more expected to flow through in 2019. We might see a more pronounced lag in NIM expansion as the fed continues to raise its rates. In regards to the trade war, the management believes that the largest impact will be on market sentiment and not directly on the economy yet. Market sentiments and anxiety have already resulted in a slowdown in equity and bond activities. DBS has already seen the impact of the property cooling measures on its mortgage loans growth. 3Q18 saw a 50% drop in new mortgage loans and the management had revised its mortgage loan target to S$2.5bn for 2018 as compared to S$4bn at the start of the year. Hence with tighter measures, we expect mortgage loan growth to slow. The rise in the cost of funds is not an issue yet for DBS. It is inevitable to face higher funding costs, but DBS’s CASA market share remains strong at 53% (despite Singapore’s CASA shrinking and migrating to fixed deposits and bonds). With an ample CASA base, DBS does not need to increase their pricier fixed deposits funding as much as the other banks. 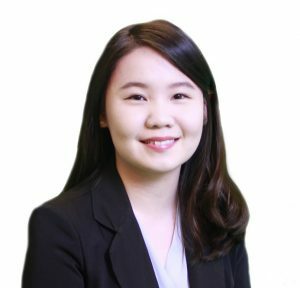 Despite the softer expectation of loans growth due to market headwinds, NIM will still be on a positive trajectory as trade issues will impact trade volumes more significantly than overall margins. The banking sector will enjoy greater pricing power as the US continues to raise its interest rates. Looking forward, asset quality is expected to be healthy, and lower provisions will provide upside to earnings. DBS remains attractive with a dividend yield of 4.5%. The management expects loan growth to slow to mid-single-digit next year. Overall outlook remains positive, and DBS targets an ROE of 13% next year. 2019’s CIR to remain around 43% while asset quality should remain stable despite the expected weakness in SME portfolio due to rising interest rates. Given the earnings trends for 3Q18 and changes in management guidance for 2019 loan growth, we trim our 2018 – 2019 net profit estimates by 3-5%. NIM expansion and lower allowances should offset lower non-interest income to a certain degree. We maintain BUY at a lower target price of S$29.00 (previously S$33.32). As we roll over our valuation to 2019e, we revised our target price lower following adjustments to our beta and terminal growth rate assumption. We are incorporating a more volatile and slower economic growth environment.